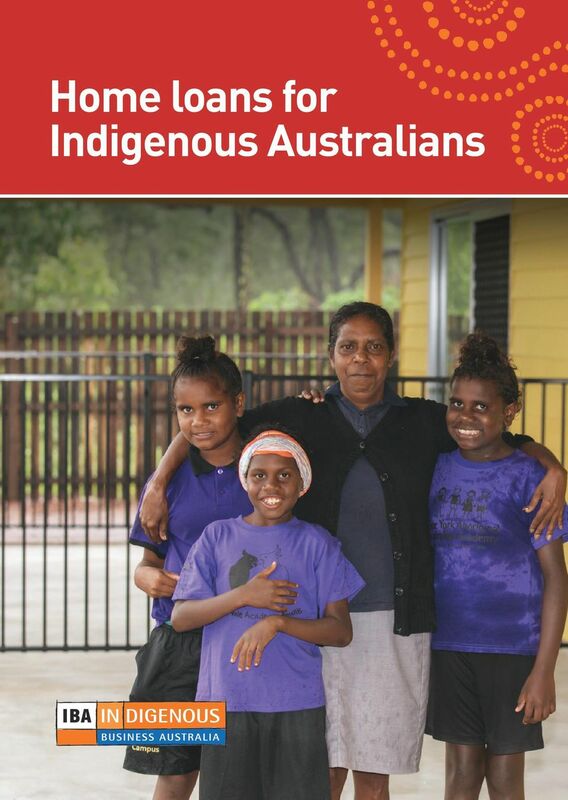 Download "Home loans for Indigenous Australians"
2 Buying a home Buying a home is one of the most significant steps you can take. Owning your own home can give you and your family stability and security. Deciding if, and when, to buy a home can be exciting and challenging. There are benefits, risks and responsibilities in buying your home, and you need to consider whether the time is right for you personally and financially. IBA s Indigenous Home Ownership program has assisted more than 15,000 Indigenous families into home ownership. 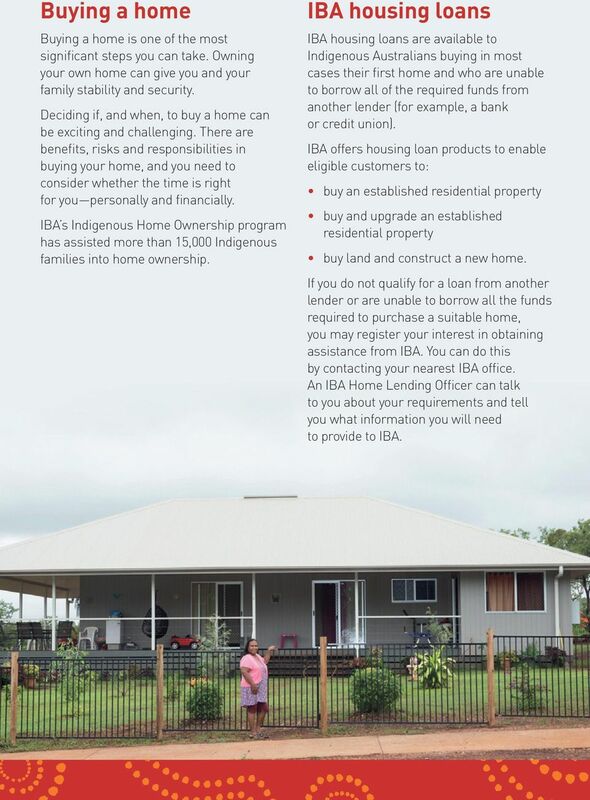 IBA housing loans IBA housing loans are available to Indigenous Australians buying in most cases their first home and who are unable to borrow all of the required funds from another lender (for example, a bank or credit union). IBA offers housing loan products to enable eligible customers to: buy an established residential property buy and upgrade an established residential property buy land and construct a new home. If you do not qualify for a loan from another lender or are unable to borrow all the funds required to purchase a suitable home, you may register your interest in obtaining assistance from IBA. You can do this by contacting your nearest IBA office. An IBA Home Lending Officer can talk to you about your requirements and tell you what information you will need to provide to IBA. 3 Deposit IBA s standard deposit requirement is $3,000. IBA requires you to contribute the maximum amount you have available as your deposit. Assistance provided through the First Home Owner Grant scheme can be used to meet the deposit requirements. Additional costs You will be required to pay for other costs in addition to the purchase price of your home. These may include your property valuation report, building and pest inspections, conveyancing costs, state-levied duties (e.g. stamp duty) and mortgage registration fees. If you are a first home buyer and don t have sufficient personal savings or access to First Home Owner Grant funds, an additional IBA loan may be available to finance these costs. 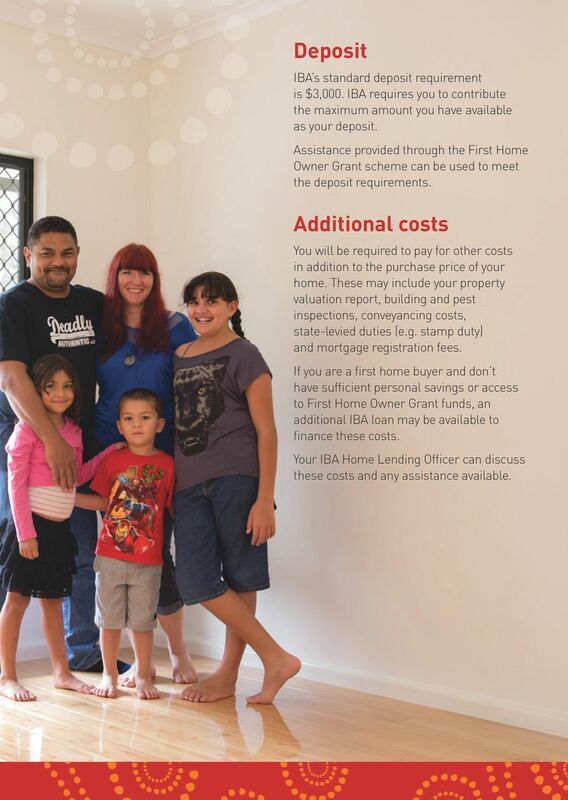 Your IBA Home Lending Officer can discuss these costs and any assistance available. 4 Loan amount The amount that IBA lends to you will depend on a number of factors such as your income, your capacity to meet loan repayments and other housing costs over the term of the loan, the value of the property you are buying, the interest rate and the loan term. In assessing each of these factors, IBA will take into account your: employment income other income you earn rental history housing and living expenses current credit cards and loans (for example, personal loans and credit cards) credit history savings history eligibility for the First Home Owner Grant scheme. 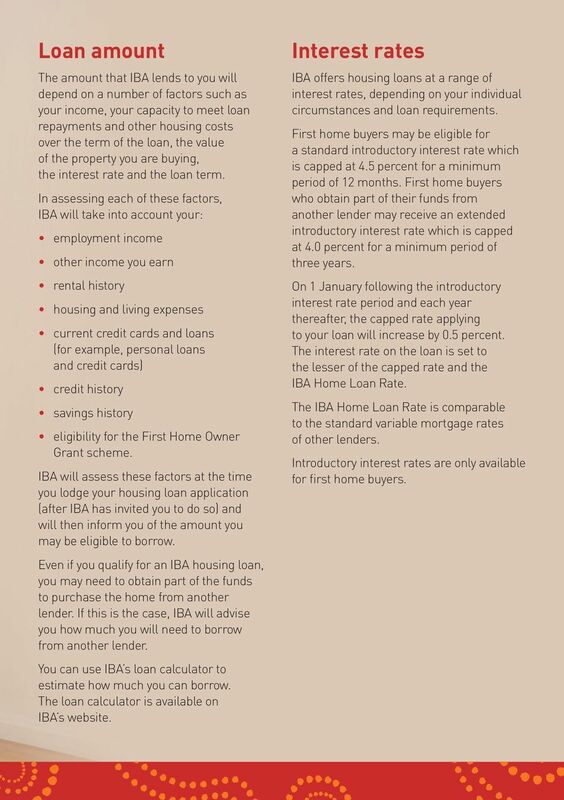 IBA will assess these factors at the time you lodge your housing loan application (after IBA has invited you to do so) and will then inform you of the amount you may be eligible to borrow. Even if you qualify for an IBA housing loan, you may need to obtain part of the funds to purchase the home from another lender. If this is the case, IBA will advise you how much you will need to borrow from another lender. You can use IBA s loan calculator to estimate how much you can borrow. The loan calculator is available on IBA s website. Interest rates IBA offers housing loans at a range of interest rates, depending on your individual circumstances and loan requirements. First home buyers may be eligible for a standard introductory interest rate which is capped at 4.5 percent for a minimum period of 12 months. First home buyers who obtain part of their funds from another lender may receive an extended introductory interest rate which is capped at 4.0 percent for a minimum period of three years. On 1 January following the introductory interest rate period and each year thereafter, the capped rate applying to your loan will increase by 0.5 percent. The interest rate on the loan is set to the lesser of the capped rate and the IBA Home Loan Rate. The IBA Home Loan Rate is comparable to the standard variable mortgage rates of other lenders. Introductory interest rates are only available for first home buyers. 5 How to apply To apply for a loan you need to register your interest by completing the following forms and send them to IBA together with the required documents listed in the Expression of Interest form. Expression of Interest form Confirmation of Aboriginal or Torres Strait Islander Descent form Consent to Use Your Personal Information form. These forms are all available on the IBA website. 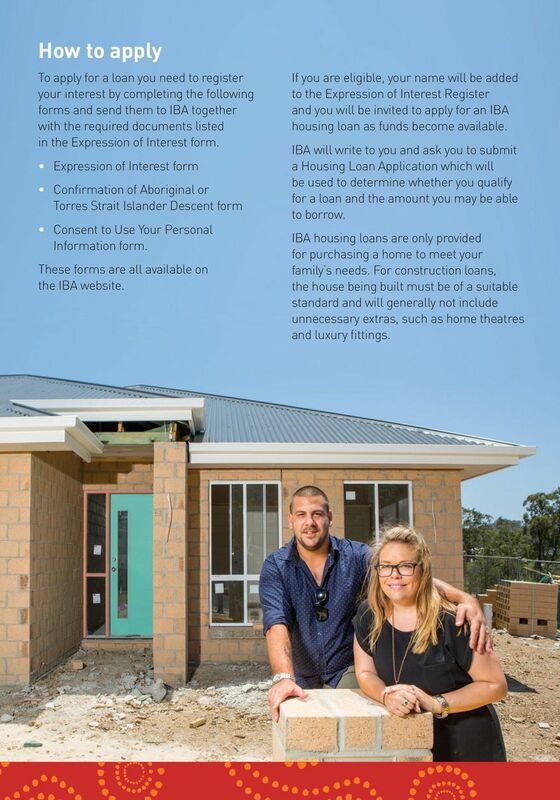 If you are eligible, your name will be added to the Expression of Interest Register and you will be invited to apply for an IBA housing loan as funds become available. IBA will write to you and ask you to submit a Housing Loan Application which will be used to determine whether you qualify for a loan and the amount you may be able to borrow. IBA housing loans are only provided for purchasing a home to meet your family s needs. For construction loans, the house being built must be of a suitable standard and will generally not include unnecessary extras, such as home theatres and luxury fittings. 6 Contact IBA IBA has offices across Australia and our helpful staff are available to assist you from 8.30am to 5.00pm, Monday to Friday. 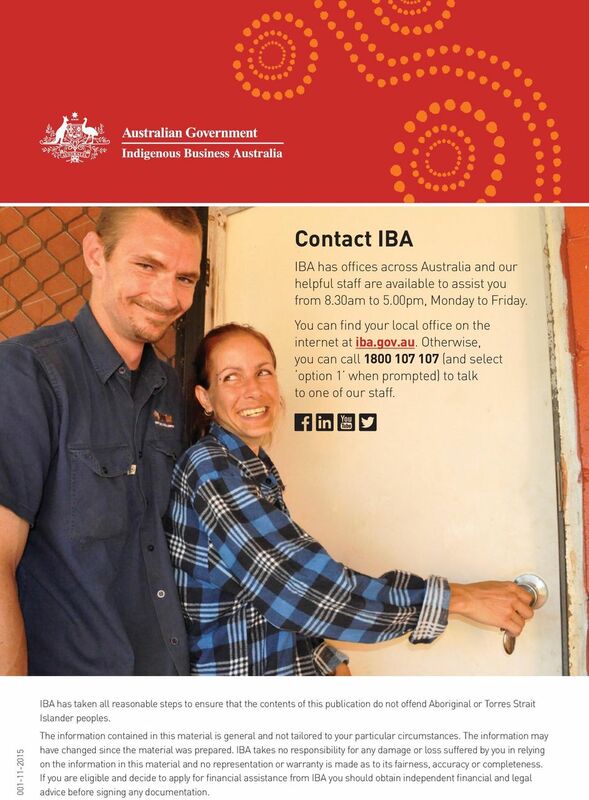 You can find your local office on the internet at iba.gov.au. Otherwise, you can call (and select option 1 when prompted) to talk to one of our staff IBA has taken all reasonable steps to ensure that the contents of this publication do not offend Aboriginal or Torres Strait Islander peoples. The information contained in this material is general and not tailored to your particular circumstances. The information may have changed since the material was prepared. IBA takes no responsibility for any damage or loss suffered by you in relying on the information in this material and no representation or warranty is made as to its fairness, accuracy or completeness. If you are eligible and decide to apply for financial assistance from IBA you should obtain independent financial and legal advice before signing any documentation. The Simple Steps to Buying a House & Land Package. Instructions on how to complete this application form are in notes below each section. Have you heard about Open Market HomeBuy? Department of Housing and Public Works Pathways Shared Equity Loan Become a home owner by purchasing a share of the property you are renting Questions and Answers Booklet Great state. Great opportunity. Easy Home Purchase Scheme Information for tenants What is the Easy Home Purchase Scheme (EHPS)? The EHPS is only available to Lewisham Social Housing Tenants who wish to buy a home in the private sector. Loan Accounts. Charges for specific services and accounts. 1. Anyone who wants to understand how FOS assesses a consumer's loss. 1.1 The vendor has no obligation to disclose to you whether there are any physical defects or the state and condition of any of the improvements. Home Loans. Talk to us today. Tariff of mortgage charges Tesco Bank is closely involved in the mortgage industry s initiative with the Council of Mortgage Lenders and Which? to make our fees and charges easy for you to understand. Welcome home. Step through the front door of your new home sooner, with NAB s range of smart and flexible home loans. Introductory Fixed Rate Home Loan Product Specification For further information www.partners.stgeorge.com.au Mortgage Central 1300 137 532 This product specification is the property of St.George Bank.